In anticipation of the upcoming Lyme Regis Fossil Festival, which takes place from May 1-3 this year, let’s set off on a literary and geological tour through the charming streets and beaches of Lyme Regis, which is also known as the “pearl of Dorset”. We will be travelling through time, so hold on to your geological hats and period bonnets! It’s a misty afternoon in early 19th century Lyme. As you make your way through a narrow street, you hear the sound of ruffled skirts brushing against the pavement. You turn to see a group of women walking swiftly towards the harbour. Could one of them be Jane Austen? 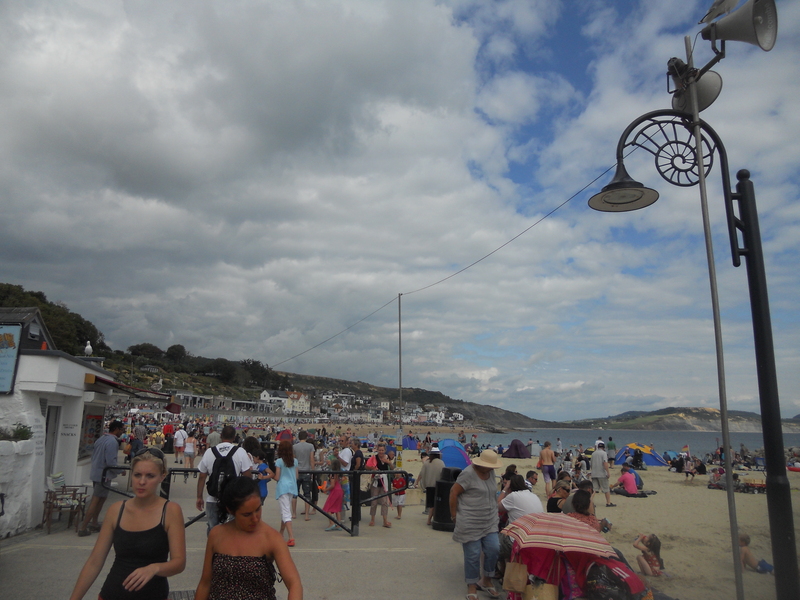 Lyme Regis was a holiday destination for the Austen family, who visited Lyme in 1803 and again in 1804. Indeed, we would know nothing of Jane’s life between 1801 and 1805, had she not written a letter from Lyme in 1804. 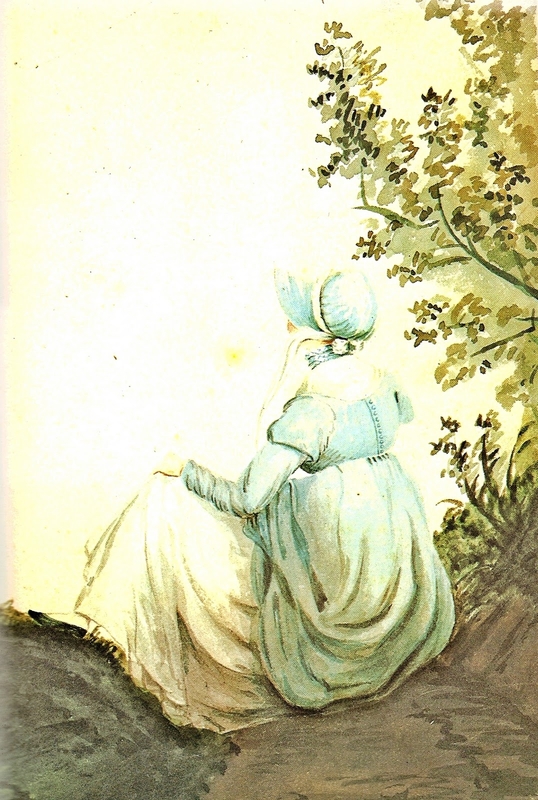 Similarly the only picture that remains of her from her late twenties is associated with Lyme- a water-sketch by her sister, Cassandra, which depicts Jane sitting outdoors in the surroundings of Lyme. In Persuasion, one of the characters, Louisa Musgrove, falls and sustains concussion after recklessly running up a set of steps on the Cobb. There has been much discussion, among Jane Austen fans, about which of the three sets of steps on the Cobb this episode refers to. Sadly however, this question may never be fully answered since the Cobb was substantially rebuilt in 1825, years after Jane’s visit. Other illustrious literary visitors to Lyme include Lord Tennyson, Thomas Hardy, Henry Fielding and Beatrix Potter. Lyme is not just a place to sit down and indulge in tales of rigid class distinctions and hopelessly romantic endings. 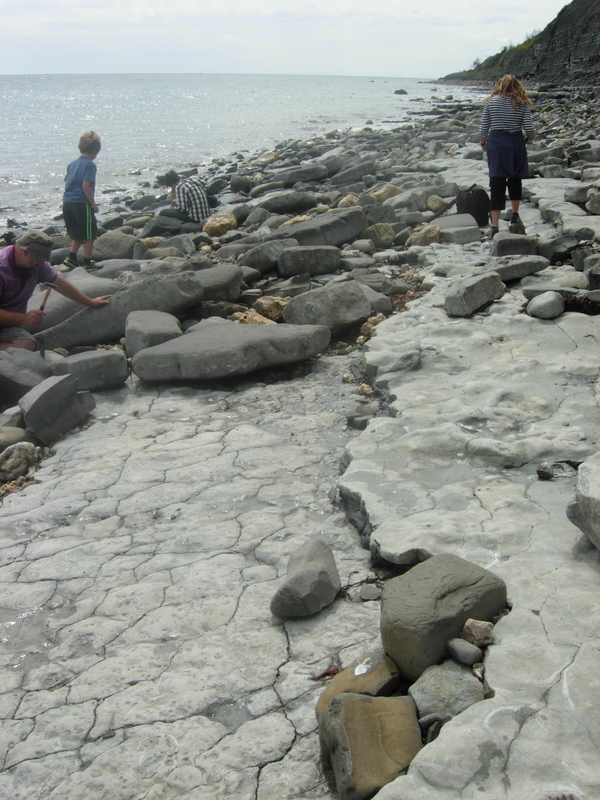 In fact, the local geology and famous fossil finds make it a popular destination for palaeontologists. The cliffs and beaches that surround Lyme are part of the Jurassic Coast, a world heritage site. They are made up of fossil-bearing beds that were deposited in Lower Jurassic and Cretaceous oceans roughly 200 to 100 million years ago. How did this happen? Remains of marine animals and plants became buried in sediments and later turned to rock, shaping the fossils we see today. Many of the earliest dinosaur fossils, as well as other marine reptile fossils, have been found along the coast that surrounds Lyme Regis. Fossil hunters can often be seen combing the beaches, since the cliffs continue to yield specimens despite two hundred years of collecting. The most enthusiastic of these can be recognised by their hunched posture and tendency to pick up and examine every pebble on the beach. 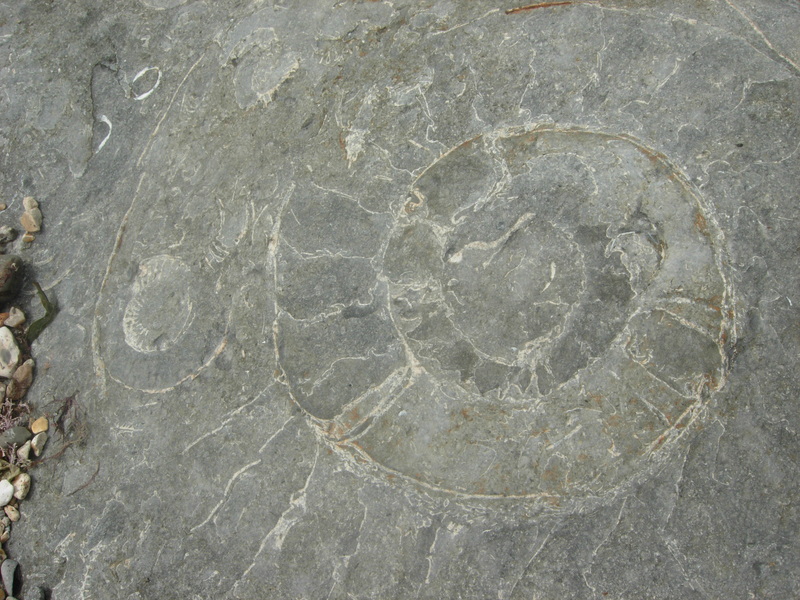 If you’re talking a walk, the fossils you’re most likely to find are those of ammonites, extinct spiral-shelled molluscs related to modern day squid and cuttlefish. A word of warning: it’s easy to contract fossil-fever here. Even the streetlamps on the Marine Parade are ammonite-shaped! And in your frenzy, you might forget that the cliffs are very steep and can become unstable. So, on a serious note, it is best to stay away from their base and to always keep in mind the local tide timetable. 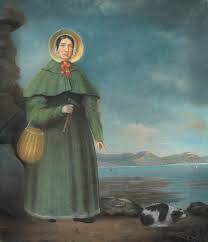 As a geologist, I could not write about Lyme without mentioning the historical figure of Mary Anning, the famous pioneer fossil collector. She was born in Lyme in 1799 and her father was a fossil collector who sold his finds to passing tourists. Fossils were regarded as “curiosities” by most 18th century folk, but Mary was aware that they had a scientific importance and she cultivated good relationships with many scholars of the time. She is credited with finding the first complete ichthyosaur, a dolphin-like reptile, the first nearly complete example of a plesiosaur, a huge marine reptile, and the first British pterodactyl, a flying reptile. You can marvel at some of Mary Anning’s creatures of the deep in the Lyme Regis Museum, an excellent place from which to start exploring the treasures of Lyme, which even features a newly-conserved coprolite (fossil dung) table owned by William Buckland. 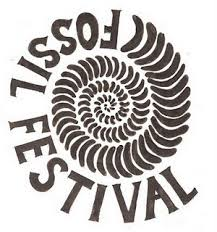 Of course, if you are visiting Lyme Regis next month, you are in luck, because the annual Lyme Regis Fossil Festival takes place from May 1-3. With a programme packed with walks, talks, theatre and music, a fossil-tastic time is sure to be had by all! If you’re travelling from London, the train journey from Waterloo to Axminster takes about 3 hours and, from there, the heart of Lyme Regis is only a 15-minute bus journey away. Remarkable Creatures, Tracy Chevalier, Harper Collins. Finding Fossils in Lyme Bay, Robert Coram BA Hons, Ocean Colour Press. Discover Dorset: Fossils, Richard Edmonds, The Dovecote Press. Jane Austen and Lyme Regis, Maggie Lane, The Jane Austen Society. Tags: 100geosites, activities, fossils, geography, geology, history, Lyme Regis, Mary Anning, palaeontology. Bookmark the permalink. Here is a blog post I wrote for the Geological Society of London: fossils and Jane Austen, what could be better? !